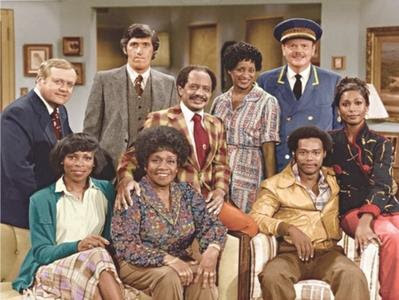 It is the theme song for “The Jeffersons”, so that makes “The Jeffersons” the perfect topic for my first post in my new house, as I re-commit to posting regularly in this blog. “The Jeffersons” got their start on Norman Lear’s groundbreaking sitcom “All in the Family”. George Jefferson, played by Sherman Hemsley, was the perfect black foil for the bigoted Archie Bunker. Accompanying George was his wife, the loving but tough Louise, who George nicknamed “Weezie”, played by Isabel Sanford, and son Lionel, played by Mike Evans, who always agreed with Archie, but made it clear to the audience the joke was actually on Archie. The Jefferson characters were so popular, they ended up spinning off to their own show. “The Jeffersons”, which was also developed by Lear, debuted on CBS in 1975, and Channel 13 on peasant vision. George, Louise and Lionel moved from their house in Queens to an apartment on the upper east side where George now had a successful series of dry-cleaning stores. They engaged the services of housekeeper Florence Johnson, played by Marla Gibbs, who matched George smart-mouth jab for smart-mouth jab. They also had a colourful array of neighbours who dropped by, bringing their unique drama. There were the Willises, Tom, played by Franklin Cover, and Helen, played by Roxie Roker. Tom was white, and George reminded him of that fact every chance that he could by calling him, “Honky”. Helen was another female foil for George, just as cutting but a little more diplomatic than Florence. George also referred to their children as “zebras”. Lionel was played by Mike Evans, but soon replaced by another actor, Damon Evans, who was no relation. I never really could warm up to the new actor, so I was glad when Evans returned to the character a few seasons later. Lionel fell in love with a woman named Jenny, played by Berlinda Tolbert, who was the daughter of the Willises, one of the aforementioned "zebras". They eventually married, had a child, had some marital troubles and eventually divorced. As black as Jenny was, her brother Allan was white, representing both halves of the interracial marriage they came from. (Isabel Sanford); Lionel Jefferson (Mike Evans) and Jenny Willis (Belinda Tolbert). Another neighbour was the eternal bachelor, Mr. Harry Bentley, played by Paul Benedict, who was an interpreter for the United Nations. He frequently had back problems, and the only thing that helped was George walking on his back. A scene of George walking on Bentley’s back actually was a snippet in the opening credits. The other bit of the opening credits I remember is George having a tantrum, putting pillows over both ears, lying head first in the couch and screaming while he kicked the couch. Two other recurring characters were Ralph the doorman, played by Ned Wertimer, and Mother Jefferson, played by Zara Cully, who was often critical of Louise. After 11 seasons, “The Jeffersons aired their last episode in July of 1985. It was one of the longest-running sitcoms in television history. Unfortunately by then, it was not being aired on the rural cable network so I never did see the way they tied things up. (Wikipedia just revealed they never tied things up. Worse, the cast had to find out about the show’s cancellation from the newspaper and relatives who read it in the newspaper). Sherman Hemsley would return to network television, playing a deacon at a church in Philadelphia in the sitcom “Amen” that aired Saturday nights, for five seasons from 1986 to 1991. Unfortunately, that’s all I can tell you about it, because it was a show not CTV, not CBC, and not Channel 7 TV thought enough of to pick up in Canada. “Amen” never aired when I could see it on peasant vision. The network tried to create a spinoff for Marla Gibbs’ character the housekeeper Florence, but it only lasted a few episodes. However, she did go on to experience sitcom success with “227” which lasted five seasons from 1985 to 1990, where she played a housewife and gossip. Again I never saw it because it was not on peasant vision. Both shows had predominantly African-American casts. They were part of a series of successful comedies on NBC that featured predominantly black casts including "The Cosby Show" and "A Different World", in addition to "Amen"and "227". "The Fresh Prince of Bel Air" followed a few years later. Hemsley and Sanford occasionally reprised their roles according to Wikipedia. The one episode I recall is the series finale of “The Fresh Prince of Bel Air”. When the Banks family was selling their house, the new owners were revealed to be – none other than George and Louise Jefferson. Perhaps the oddest bit of trivia, connecting “The Jeffersons” to the present day is this. Roxie Roker had a son, who went on to become a pretty renowned musician – Lenny Kravitz, who achieved success with songs such as “It’s Not Over ‘til It’s Over” and a remake of “American Woman”. He also appeared in “The Hunger Games” movies. However, having said that, it took chances, and broke ground as a sitcom. It explored the nature of race relations not just through the lens of black families and white families, but through an interracial family. There have been few series since then that have featured African-American actors in leading roles. Shows such as “Blackish” owe their existence in part to “The Jeffersons”. Like Norman Lear’s other shows it also did tackle some social issues such as racism, alcoholism, and suicide. And it had that great theme song that I kept humming over the past month as I moved to the east side to a deluxe house on the ground.